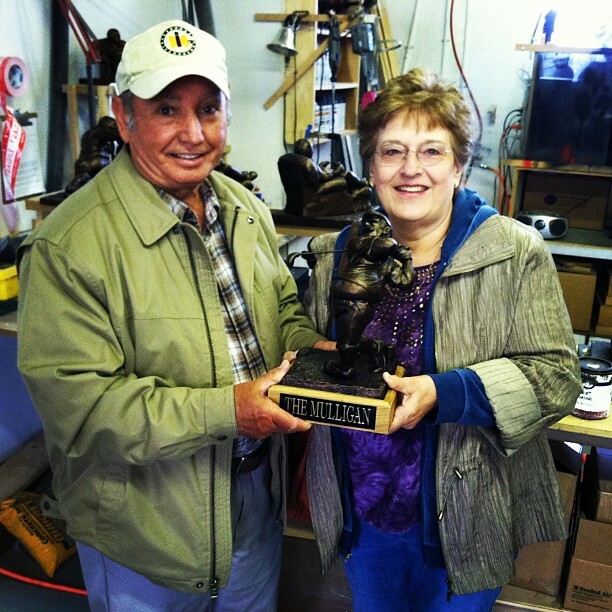 Over the years I’ve gotten quite a few questions regarding how I decided to make my first fantasy football trophy. It was back in 1993 and I was going to art school at the time. Even though I was a painting major I was required to take my fair share of sculpture classes. My favorite was life sculpture which was a 3 hours class that met twice a week. It was there that I decided I would take some of the clay we were given and use about a third of it to sculpt a fantasy football trophy. You see, I had won my league in it’s inaugural season in 1991 and I knew I needed to make a trophy that would represent our league for years to come. We were playing for a cash prize at the time but a trophy would make winning the league that much more exciting and the champ would have ultimate bragging rights. After all, I feel that is really what fantasy football is all about. The cash is nice but it’s gone in a matter of weeks and then your championship is more or less forgotten. A trophy though would keep a history of the league. Each champ would have his name engraved on a plate along with the team name and year and thus remembered forever. It took me a few weeks to finally finish the sculpture of the Armchair Quarterback and then it moved on to the mold making stage. The initial trophy was plaster so the mold was a throw away mold made out of a softer plaster that would get chipped away. After I gave the trophy a bronze finish I built a base out of wood and had plates engraved for the first few years. I unveiled the trophy at our fantasy football draft and my buddies went nuts. Our league is finishing up it’s 26th season and 7 of the original 10 guys are still trying to desperately win it all. Now we have 14 teams and the competition and desire to win our “Fedele Trophy” has never been so intense. Even though a few team owners have changed over the years, one thing will always remain the same –the desire to win THE TROPHY! My parents paid FantasyTrophies.com a visit yesterday and got to see the new Mulligan golf trophy. It was in their Cleveland garage back in 1993 or so that FantasyTrophies was born. I first started sculpting the Armchair Quarterback there while going to art school and then moved on to doing the Armchair Ace and Armchair Big Man. I bet they never dreamed that I would’ve been able to turn that first trophy into a business that I now run out of Brooklyn, NY. Both gave their approval of The Mulligan.